Speakers: Colin McLean and Dr Natalie Coull from Abertay University’s Division of Computing and Mathematics plus Susan Riccio from PIB Insurance. Colin McLean is a Lecturer in Computing at Abertay University and Certified Ethical Hacker trained in Internal and External Penetration tester. 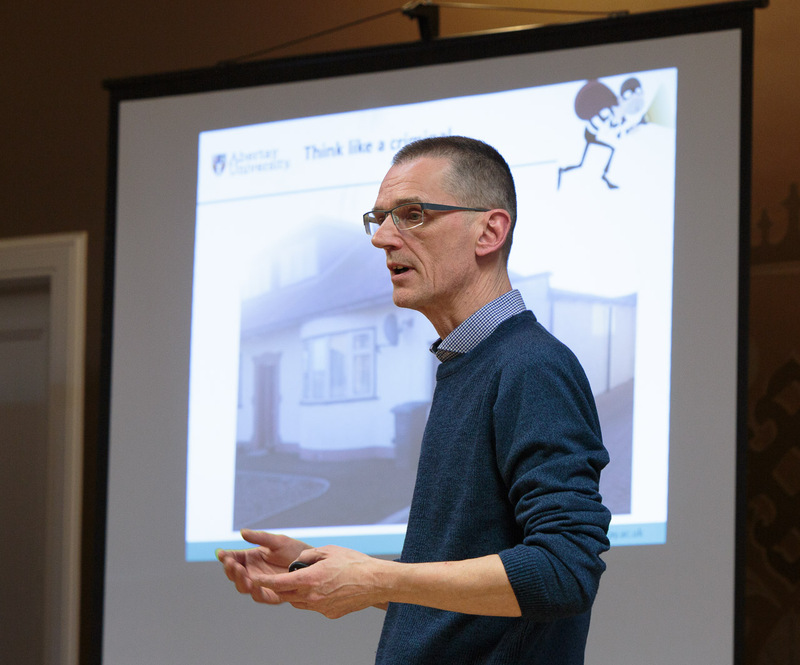 In 2006, Colin developed the BSc in Ethical Hacking at Abertay University – the world’s first undergraduate degree with the word “hacking” in the title. In 2015, Colin was listed in the Top 100 people driving the digital agenda in Scotland by Holyrood magazine. Dr Natalie Coull is programme tutor for the MSc in Ethical Hacking at Abertay University and teaches a range of subject areas from programming to ethical hacking. Natalie won the Outstanding Woman in Cyber award at the inaugural Scottish Cyber Awards last year and is involved in a number of initiatives to increase the number of women who choose to study computing. Natalie and Colin explained the rationale and approach behind ethical hacking before giving examples of recently-discovered common website vulnerabilities and the costs if your company is affected. 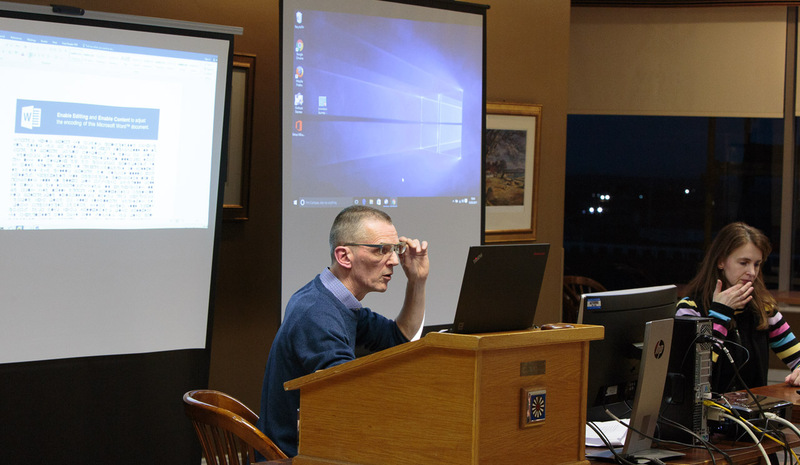 Ethical hacker and lecturer Colin McLean of Abertay University at the event. They then went through some typical hacker/victim scenarios, showing how people can make a vital mistake – clicking a link or opening an attachment – which gives the hacker access and then demonstrated the range of things the hacker can then do. Colin McLean and Dr Natalie Coull from Abertay University demonstrating typical hacker/victim scenarios. Before the talk they profiled the Club and an organisation connected with it and explained the weaknesses they found. Finally, Colin and Natalie explained the things you can do to protect yourself and your organisation. Susan Riccio is a Senior Financial Lines Account Executive at PIB Insurance Brokers. Susan has more than 30 years’ experience in the insurance industry. Her specialisms include cyber liability, professional indemnity and management liability. 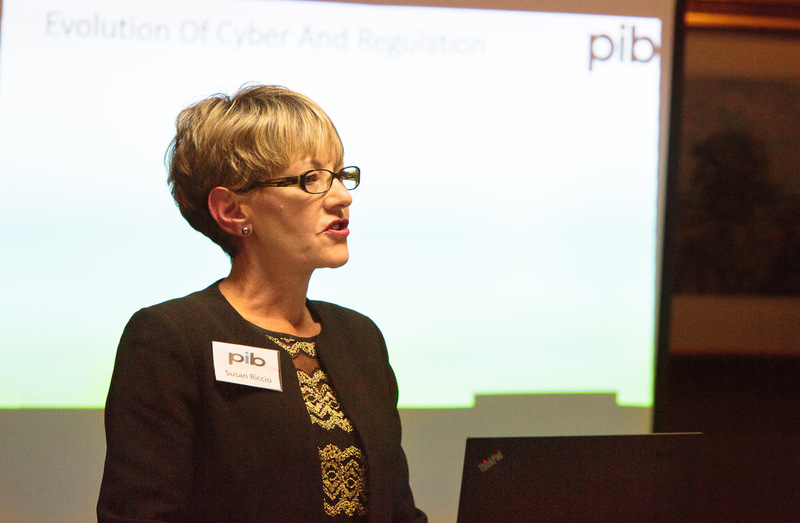 Susan Riccio from PIB Insurance Brokers outlined the evolution of cyber risk and regulation before going on to explain cyber risk and data breach insurance and the types of losses and incident/crisis response services it covers. Susan first outlined the evolution of cyber risk and regulation, before going on to explain cyber risk and data breach insurance and the types of losses it covers and the incident/crisis response services included. Finally Susan gave examples of past claims and how you can mitigate against cyber risk in a bid to protect your balance sheet and your organisation’s reputation.